Please note that as of Patch 0.8, the crafting research system has been revamped and this guide is now obsolete. Check out our revamped guide to crafting research and specialization for up-to-date information! Patch 0.7.1665 brings with it the new crafting research system. You’ll no longer have access to all crafting recipes automatically – instead, you’ll have to research the different recipes before you can craft them. This process costs time and crystite, and it’s intended to encourage players to specialise rather than trying to do everything themselves. It’s possible to be an all-rounder, of course, but you’ll need to make careful decisions about what you research and where you spend your crystite. The molecular printer features some changes to the interface – the menu on the right side is now separated into Refine, Build and Research tabs. The Research tab is where you learn recipes, or nanoprints, to use for crafting, and you’ll find the nanoprints in the Refine and Build menus once you’ve researched them. We’ll have a more detailed guide available shortly, covering complete research progression and costs, but in the meantime we wanted to give you an introduction to how research works. 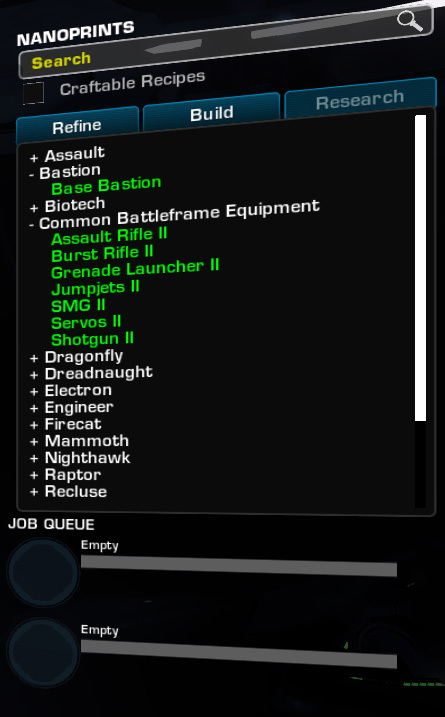 Research is divided into up to eighteen categories: Resource Acquisition & Refining, Consumables, Common Battleframe Equipment, and one category for each frame. However, you won’t be able to access (or even see) the research categories for frames you haven’t unlocked to play. Remember, as you look at these, that in a number of cases you will be researching recipes that were temporarily available to you before this patch. This covers two main types of research: increasing the number of refining slots available to you, and researching advanced thumpers. You’ll start out with Raw Resource Refining I (with one resource slot) and you’ll need to research Raw Resource Refining II+ to add extra slots to your refining recipes. Each unlock here also adds an upgraded Crystite Refining recipe to turn refined resources into crystite. Without research, you’ll be able to build Stock Personal and Squad Thumpers only. You’ll need to research Personal Thumper I+ and Squad Thumper I+ before you can craft them. These research items are a progression sequence – to research Personal Thumper III, for example, you’ll first need to research Personal Thumper I and then Personal Thumper II. Recipes you research in this menu will be available in the Refine area for resource refining and crystite refining recipes, and Build > Thumpers for the thumper recipes. This is fairly self-explanatory, and recipes you unlock via consumables research can be found in the Build > Consumables menu. At the moment the only research available is for Medium Health Packs, but as more consumables are added to the game in future this category will expand. This category covers gear that can be equipped on any battleframe: secondary weapons, jumpjets, and servos. Research progression for these recipes is the same as for the frame-specific research, and the recipes you unlock will appear in Build > Battleframe Equipment. Once you have access to the research category for a particular frame, you start by researching the Base Research for that frame – Base Recon, Base Mammoth, etc. This takes 1,000 CY and 10 seconds, and it will unlock crafting of all the Stage I recipes for that frame. For example, researching Base Recon will allow you to craft all the Stage I Accord Recon equipment (including the two modules that aren’t part of the default loadout). Completing the Base Research for a frame then unlocks Stage II research. However, each Stage II item must be researched separately – so each frame will have seven to nine Stage II researches to conduct: primary weapon, three different abilities (five for Accord frames), passive, HKM, and plating. These cost 5,000 CY and 2 hours each. Once you’ve completed Stage II research for an item, you’ll be able to research the Stage III variant. Stage III research takes 10,000 CY and 12 hours to complete. Completing Stage III research will allow you to research the Stage IV upgrade, which is the highest level of gear. Stage IV research takes 25,000 CY and 5 days to complete. Recipes you unlock via this research will appear in Build > Battleframe Equipment, with submenus for each frame type. Note that each frame is handled separately, so you don’t need to do any research for Accord frames before starting research on the advanced frames. This applies to all recipes for battleframe gear, including common battleframe equipment. Base Research (unlocks all Stage I): 1,000 CY & 10 seconds. Stage II: 5,000 CY & 2 hours. Stage III: 10,000 CY & 12 hours. Stage IV: 25,000 CY & 5 days. That was fast! Thanks for the info!